It seems that the small tropical island of Bali is always in the Australian news for all the wrong reasons. Bombings, drug smuggling cases, child abuse at a hotel child minding crèche as well as the general concerns regarding security in Indonesia have dominated the media's coverage of Bali recently. Of course Bali remains a tropical paradise rich in cultural heritage, home to gentle friendly people and fantastic scenery. The coconuts still grow on the trees, and there is still fish in the sea. Bali TV on the Palapa C2 satellite is an ideal virtual tourist destination. Bali TV commenced regular programs with a ceremony broadcast live from Bali's Taman Budaya cultural centre in 2002 and has since grown to be an integral part of Balinese life. The station is the only Balinese focused television outlet in Indonesia. Bali TV promotes itself with the bye line "Matahari dari Bali" (Sun from Bali) aiming to promote and foster Balinese culture, traditions, and tourism. The majority of the programs are presented in the Bahasa Indonesia language with the exception of a daily news broadcast, Orti Bali, which is presented in the traditional Balinese language. Bali TV's schedule includes programs such as "Klip Bali" which feature contemporary Balinese music as well as the more exotic Balinese Gamelan ensembles which play into the night, accompanying live coverage of Balinese dance, and drama. One of the most watched musical programs is "Gita Shanti" which presents a popular style of choral singing with a Balinese melody. Colourful Temple Festivals are an important feature of Balinese life and are covered extensively in live broadcasts as well as news and magazine programs. Other fascinating viewing is the Hindu dramas featuring the animal deities from Hindu Mythology, including Garuda the king of birds, Ganesha, the elephant-headed son of the goddess Durgha, and Hanuman, the monkey god. It is after Garuda that the Indonesian National Airlines is named. 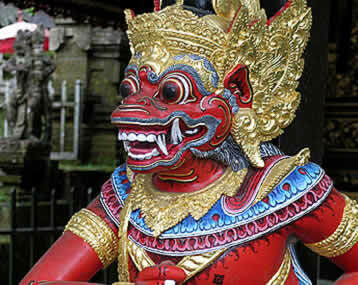 Even today, Garuda is much revered by the Balinese for his ethics and his strength in applying his ethics to correct evil-doers. Seputar Bali Pagi, the morning news in Indonesian airs around 6:30 AM Bali time (8:30 AM Australian Eastern Standard Time). Seputar Bali, the evening news in Indonesian airs at 6:30 PM Bali Time (8:30 PM Australian Eastern Standard Time). Orti Bali is the island's news presented in the Balinese language at 7:30 PM Bali Time ( 9:30 PM Australian Eastern Standard Time). Bali TV can be received free-to-air in Australia and New Zealand via the Indonesian satellite Palapa C2. Bali TV is featured in the MediaExplorer package on DVD Disk Four.